Captain Stewart Murray Hansen a young architect of Williamstown, enlisted in the AIF in September 1914, one month after war was declared. He was in the fighting at Gallipoli from the first day to the last day of retreat and evacuation, April to December 1915. Although he was evacuated to Egypt, emaciated, suffering from malnutrition, typhoid and dysentery, army records listed Stewart as “died at Gallipoli,” and his mother received this notification. But many weeks later she received a letter from her son, telling her he was no longer at Gallipoli, but was now recuperating in Egypt, Mrs Hansen sent a “Please explain” letter to Defence Records, who admitted their error, assuring her that her son was receiving the best medical treatment in Egypt and regaining his strength. Mrs Hansen was a member of the Williamstown Anzac Club which sent comfort parcels direct to local soldiers at the front . These were wrapped in a calico bag which the soldier could use as a laundry bag, or to hold personal effects. Mrs Hansen and friends decided to use uniform square offcuts of calico as a fund raiser, by asking locals to sign their name on a space on a square and pay sixpence. 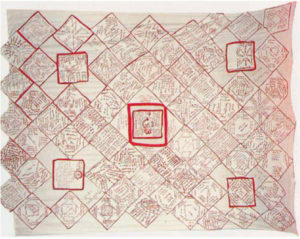 As each square was filled, the ladies would stitch the signature in red cotton thread and bind the edges in red before assembling them as a quilt.. But the ladies decided to make their quilt “different” and so, Mrs Hansen sent squares to her son Stewart for him to collect serving men he met, to post home for inclusion . And so Stewart collected signatures of men from his 14th Battalion plus nurses, medics, doctors, members of the new Air Corps, Officers and even cooks and stewards, He sent the squares home for embroidery by his mother and friends. One square commemorates Albert Jacka of the 14th battalion, the first Australian winner of a Victoria Cross at Gallipoli. After being wounded in France, Stewart again collected signatures. He was awarded the Military Cross after action at Pozieres, a battle where 23,000 Australians lost their lives. Stewart had been wounded several times, but he was mortally wounded at Mouquet Farm on 4th February 1917. His mother and friends continued to embroider and assemble the 72 squares, containing hundreds of Stewart’s collected signatures, often with service numbers, rank, battalion included. Volunteer Pat Klemm has listed them all, and future research will be needed to establish the various theatres of war they represented and if they survived. Our Quilt is now 100 years old and has been exhibited in several outside galleries over the years, mostly because of its uniqueness in containing signatures of serving personnel, not just contributing local donors.